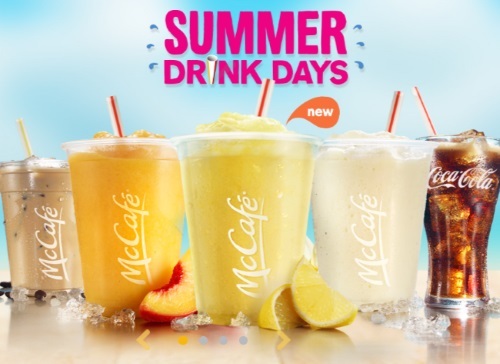 Mcdonalds Summer Drinks Days are here! The perfect way to cool down all day, everyday, all summer long with $1 drinks! Along with the usual $1 fountain drinks this year they also have: $1 McCafe Frozen Real Lemonade (small), $2 McCafe Real Fruil Smoothie (small), $2 McCafe Frapp (small), $1 McCafe Premium Roast brewed ice coffee (small or medium). At participating McDonald’s restaurants in Canada. Not valid with any Extra Value Meal, Happy Meal® or other McCafé beverage. Product availability varies by restaurant.